Although the Swedish car company Saab unfortunately no longer makes any vehicles, there are still enough cars of this brand. One of the popular models was the Saab 9-5, which was made from 1997 to 2011, with some intervals. 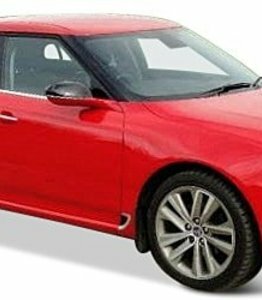 The windscreen replacement of a Saab 9-5 can be quite expensive at a brand dealer and moreover, these brand dealers are not much to be found anymore. An easier and cheaper way to replace the Saab 9-5 windscreen when it is broken is by purchasing after market car windows. How this works, we tell you here. The special history of Saab, which unfortunately has come to an end at least for the time being, cannot, of course, be ignored. The Second World War had an enormous impact in large parts of Europe. In Sweden, as the country remained neutral, this was considerably smaller. It was therefore possible for SAAB AB, which was founded in 1939, to start up a new sub-company immediately after the war that would focus entirely on the production of cars. Prior to that, SAAB was only involved in the development and manufacture of fighter planes, but this market collapsed logically after the end of the war. was not able to save Saab in 2010 and 2011, and even the NEVS, which was subsequently put in place, had to give up in 2014. Since then no more cars of Saab have been rolled off the band. In addition to the many acquisitions, Saab also worked with various other brands in the years that it existed. A concrete result of this was the Saab 9000, which appeared in 1985. Saab had previously sold a rebadged version of the Lancia Delta and had had warm contacts with Fiat about it. A common platform was created: the Type Four chassis. The Alfa Romeo 164, the Fiat Croma, the Lancia Thema and the Saab 9000, among others, were modelled on this. This Saab 9000 was the first truly luxurious model of Saab. The Saab 9000 was made up to and including 1998, but as early as 1997 the successor was presented in honour of the anniversary of the parent company of Saab. The new version of the Saab 9000 was called the Saab 9-5. Of course, the Saab 9-5 opted to build the car on a General Motors platform to avoid large expenses. The GM 2900 platform was also used to produce the Opel Vectra, Opel Calibra and Saturn L series. When Spyker took over Saab in 2010, the Saab 9-5 was the first model they were going to make again, despite the fact that the car was completely designed by General Motors. However, it soon became clear that there were serious liquidity problems at Spyker. The production was halted after only one year. So few of this second generation Saab 9-5's have been made and sold. In total, only just over 11,000 copies seem to be involved. The windscreen replacement of a Saab 9-5 therefore almost always involves cars of the first generation. When is a windscreen replacement of a Saab 9-5 really needed? The windscreen replacement of a Saab 9-5 is not necessary when there is only a small asterisk in the car window. In that case, window repair is a cheaper solution. When there is a crack in the windscreen, reparation is unfortunately no longer possible, but you do not necessarily have to immediately replace the windscreen of your Saab 9-5. Especially if this crack is not in the direct view of the driver and is not too big, you can drive on with it. This is different when the crack in the windscreen has branches or is in the direct view of the driver. There are several reasons for this. First of all, a large crack and a branched crack cause the windscreen to be less strong. The stiffness of a car is largely due to the windscreen. If there is a large crack in it, it is no longer optimal and the occupants are not as safe as with an intact windscreen. Secondly, sunlight or light from oncoming vehicles, for example, may reflect into the driver's eyes through the crack, resulting in dangerous situations. Since repairing a crack in the windscreen is not possible, replacing the windscreen of your Saab 9-5 will be unavoidable in that case, unfortunately, in order to be able to safely enter the road again. What does it cost to replace the windscreen of your Saab 9-5? We are often asked what it costs to replace a windscreen. However, there is no direct answer to this question. It depends on many different factors what the price of a windscreen is. Matters such as a coating, window heating, sensors or cameras can quickly lead to a higher price. In all cases, however, the windscreen replacement of your Saab 9-5 through us involves considerably less cost than this work to be carried out at a garage. This is because you can order an after market car window here. This automotive glass is manufactured in exactly the same factory as the car windows that brand dealers sell and are therefore of exactly the same high quality. The only difference is that there is no brand logo on after market automotive glass. As a result, these car windows can also be sold by non-brand dealers, and market forces ensure that prices are considerably more favourable for you. It is also possible to replace your Saab 9-5 windscreen yourself when you buy the car windows here. Simply order the automotive glass and its rubbers and frames. We make sure that you receive the products fast, so that you can quickly replace the windscreen and safely get back on the road with your Saab. If you don't have this knowledge in-house, our FOCWA certified partners will be happy to help you out. They even come on location for the windscreen replacement of your Saab 9-5. Also in this case, the costs are much lower than at a brand dealer or garage. Choose the best price-quality ratio and order a new Saab 9-5 windscreen today!